Sign up to compete using the online registration you’ll find on the racing page. 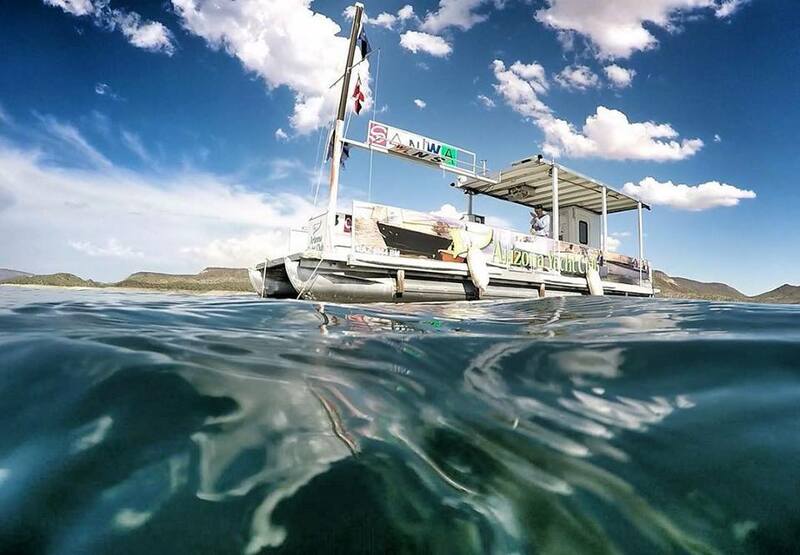 Lake Pleasant (LP) race series begin in September and January, so to catch the series at the start you should sign up about a month in advance (or as soon as registration is available). You may also sign up for a single day of racing by filling out an entry and delivering it with entry fee to the race committee either on land or at the committee boat. Download and read the Notice of Race, Sailing Instructions, and the TTL chart. Try to get familiar with the Racing Rules of Sailing —the national and international rules that govern nearly all racing, including ours. I highly recommend Dave Perry’s book, Understanding the Racing Rules of Sailing (let me know if that link stops working), which begins with a very brief, mostly understandable explanation of the rules intended for people new to racing. Don’t worry if all this seems too complicated and confusing because we all think it is too. The approximate starting order of fleets will be displayed on the side rail of the RC (see picture below), with the first to start nearest the bow of the boat. The fleets typically start fastest to slowest and one design before handicap fleets. Fleets start using a combination of horns, flags and sign board signals. Sign boards will appear on a rack at the top of the RC boat and you should read them bow to stern (not left to right). The course will be described by letters and symbols on the sign board rack. The first board will be your fleet board. The second will be the course type (windward-leeward, triangle, Olympic or X). The next letters indicate the race marks you’ll round (keeping the big yellow balls or green thingie on your port side) in the order you’ll round them. For instance, a triangle course might be N, W, S. In that case, you’d sail through the start line to the north mark, then the west mark, then the south, and then sail through the finish line (between the yellow ball and the mast of the RC). Here’s the map of the courses. When your fleet board goes up on the overhead rack, you’ll have exactly five minutes to the start. When the blue flag with the white square in the middle goes up on the mast, it’s four minutes. When that flag comes down it’s 1:00. When the sign board flips, the race is underway. A horn should accompany each change. Here’s a chart showing the start sequence. At the start you’ll sail through the start line between the red ball and the mast of the RC (hard to see the line since it’s drawn on water), heading in the direction of the first race mark. Do not sail through the start line again or through finish line until it’s time to finish the race. At first it’s best to watch the other racers and do as they do. Measure your speed and direction against theirs. Are you “pointing” as close to the wind as they are? Are you trimmed as they are? Are you going as fast as they are? This is one of the greatest values in racing: learning by measuring your performance against others’. If you’re racing “One Design,” all the boats are deemed equal and whoever crosses first is the winner. If you’re in a “handicap” fleet, each boat is assigned a performance handicap number indicating the boat’s expected speed. The lower the number, the faster the boat. At the end of the weekend’s racing, the club scorekeeper enters your starting time, finishing time, and handicap into a computer program and sorts out the finishing order of the boats. You may be surprised at where you finished—either better or worse than the order in which the boats crossed the finish line. A fast boat might finish several minutes ahead of a slower-rated one and the slower-rated boat will be time-adjusted to finish ahead. Clipboard or waterproof envelope for key papers: the lake chart, race documents and the list of sail numbers for your fleet. Some tape this to the boat. A countdown timer for the 5:00 start sequence. It’s helpful if you have one that you can re-synchronize if you don’t quite hit the 5:00 horn to start it. You can synchronize at the 4:00 mark, for example. Designate someone on the crew to see, announce, and write down the course. In the commotion of the start, it’s easy to miss. It’s useful to have a VHF radio and to monitor the race committee’s channel, number 68. They may offer information or talk about moving marks. Our fleet may discuss whether to run another race or other issues. And you can radio the RC if you decide to head in early, rather than sailing to the RC to tell them. 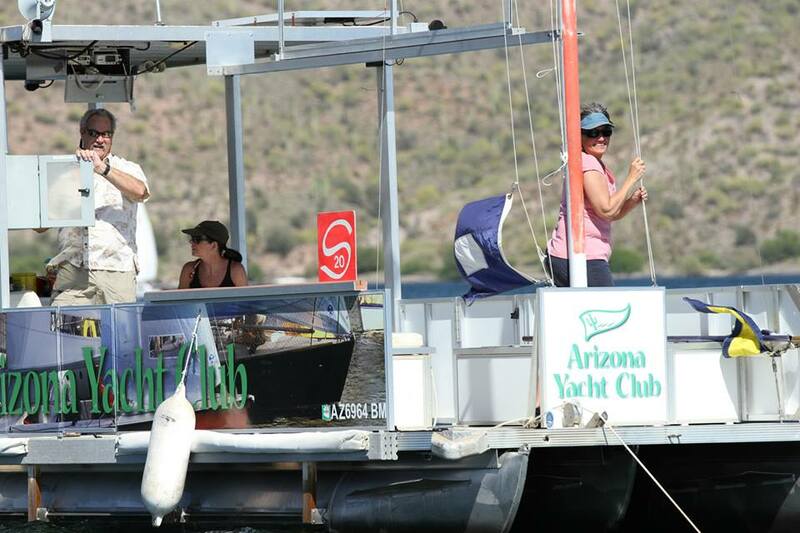 The race committee boat with a Santana 20 fleet board on the rail. This indicates that the Santana 20 fleet will probably start next. Chris Smith jumped in the water to get this shot. Besides being a cool picture, you can see the course board on the top of the boat. It shows the Santana 20 fleet is in start sequence and will be sailing a triangle course from the start line to the north mark, then the west mark, and then the green alternate mark before finishing.